Muddy Loafers: HILDA MUNTHE-LONELY MISTRESS OF HILDASHOLM. HILDA MUNTHE-LONELY MISTRESS OF HILDASHOLM. The drive from Stockholm to Dalarna County in the north west of Sweden is about three hundred kms. It winds through miles and miles of conifer forests interspersed with fields of wheat and rye. Here and there among the greenery are clusters of red roofed cottages that paint a pretty picture against the dark green shades of the forest. The roofs have low maintenance as the red paint comes from copper mining debris in the region, mixed with arsenic and other chemicals. It ensures the durability of the wooden constructions and keeps them termite free. My destination is Leksand on the banks of the Siljan Lake. Three hundred million years ago a meteor fell over Dalarna, and this large lake was born. On its banks are many picturesque villages. Leksand is one of them. The houses here are surrounded by sprawling lawns. Terraces of multicolored flowers and lush green meadows reach down to the water’s edge. Hildasholm, a 14-roomed mansion overlooking the lake has a very romantic setting. The Nature Park surrounding this mansion has been artistically landscaped into several small colourful gardens, amidst patches of untamed jungle. They are patterned after English gardens, and many of the plants and sculptures have also been imported from England. Wandering through the yellow peacock garden, the evergreen junipers, and the green arch temple makes one feel like Alice in Wonderland. There is a medicinal garden in memory of the famous Swedish doctor and author Axel Munthe. The fountain garden with its fountain surrounded by granite pillars which are topped with iron urns, was opened by Queen Victoria of Sweden in 1924. This ornamental landscape is the untiring work of Hilda Munthe the second wife of Axel Munthe, who lived in the early 20th century. He was a great nature lover and fell in love with the beauty of Leksand. He built the Hildasholm Mansion earlier known as ‘Stone Court,’ as a wedding present for his young wife Hilda Pennington Mellor. She toiled for ten years to turn this wild park around the mansion into a thing of beauty. Yet Munthe never lived here. He resided permanently on the Isle of Capri, in his Villa St. Michael, attending to his patients or traveling around Europe on his various errands of mercy. When not preoccupied with his profession, he was in the company of the chronically ill Princess Victoria of Sweden, both as her physician and close friend. She always spent the long winter months in Capri. Though the Princess was married to Crown Prince Gustav, she found him uncultured and boring. Munthe was her soul mate. She shared his love of Arts, Music and Photography. People gossiped but there was nothing much they could do. The Princess and Munthe traveled together to Venice. The duo even teamed up in concert, she playing the piano and his rich tenor ringing out in song. Though he was pursued by rich and famous women, Munthe was obsessed with the princess. “You are the woman of my heart,” he said. This relationship was probably the cause of his divorce from his first wife. But as he aged, he realized the futility of this liaison. They could never marry. He longed for a wife and family. So in 1910, he chose a bride from the English aristocracy, the young Hilda Pennington Mellor. Though she bore him two sons, she hated living in Capri because of his relationship with the Princess. She was jealous not only of Victoria but suspicious of all the other women who fawned over him. They separated in 1919, and Hilda left Capri for good. Ironically, Munthe’s marriage brought a chill into his relationship with the Princess. Her visits to Capri became less frequent. Even so, when she was crowned queen, she appointed Munthe as her personal physician. They eventually fell out with each other over political differences. But he was by her side when she died in 1930. Axel Munthe returned to Sweden only when he was old and almost blind. He dedicated his book ‘The Story of St. Michael” to the Princess. 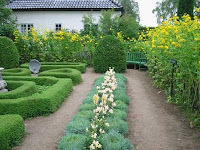 Today Hildasholm and its gardens are owned by the Stifteson Foundation run by the Leksand Church and the Municipality. It was donated to the county by her son Malcolm in 1980. Labels: Capri, Gardens, Hildasholm, Leksand, Munthe, Villa St.Michael.